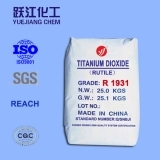 R1931 General Use Rutile Titanium Dioxide Product Description: R1931 is general use, multi-purpose rutile titanium dioxide pigment coated with dense ZrO2 & Al2O3 and special organic surface treatment. Products quality are very close to international advanced chloride process TiO2 products, having extreme whiteness and gloss, blue undertone, superfine particle size & narrow size-distribution, great UV-absorbing capacity, outstanding weatherability and chalk resistance, excellent hiding power and tinting strength, very good dispersion and stability. The products also show high gloss retention and tint retention, ensuring long term on exposure to weather conditions. Applications: Rutile Titanium Dioxide pigments R1931 is high grade, general use, multi-purpose product, widely used in industries such as high grade indoor&outdoor coatings, interior and exterior latex paints, industrial coatings, powder coatings, plastics (PVC, PE, polystyrene and polyurethane etc. ), masterbatch, PVC profile, rubber, high-grade printing ink and paper making, etc... Basic Information: Chemical Name：	Titanium Dioxide (TiO2) CAS NO.：	13463-67-7 EINECS NO.：	236-675-5 Color Index：	77891, pigment white 6 ISO591-1:2000：	R2 ASTM D476-84：	III, IV Appearance：	White powder Technical Specifications：(Standard：Q/SNBJ1-2012) Property	R1931 TiO2 content %	≥93.0 Rutile content %	≥98.0 Color (compared with standard sample) ∆L*(sample-standard sample) ∆s=(∆a2+∆b2)0.5 Not lower than ≥-0.3 ≤0.5 Matter volatile at 105oC %	≤0.5 Matter soluble in water %	≤0.5 Residue on sieve 45μm %	≤0.05 PH of aqueous suspension	6.5-8.0 Brightness %	≥98.0 Oil absorption g/100g	≤18.0 Tinting strength, Reynolds number ≥1920 Package: 25kg paper-plastic compound bag, or as clients' requests offer 500kg/1000kg big woven plastic bag. Storage and Safety: The product is a kind of white powder which is safe, nontoxic and harmless. Keep from moisture during transport and should be stored in a cool, ventilated, dry place. Avoid breathing duct when handling, and wash with soap & water in case of skin contact. For more details, please refer to the Material Safety Data Sheet.